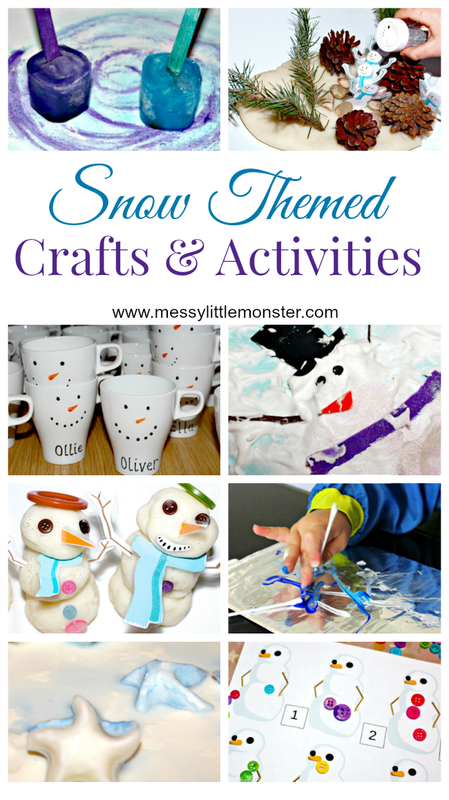 As it gets colder and we head towards Winter snow crafts and snow activities for kids become more popular! 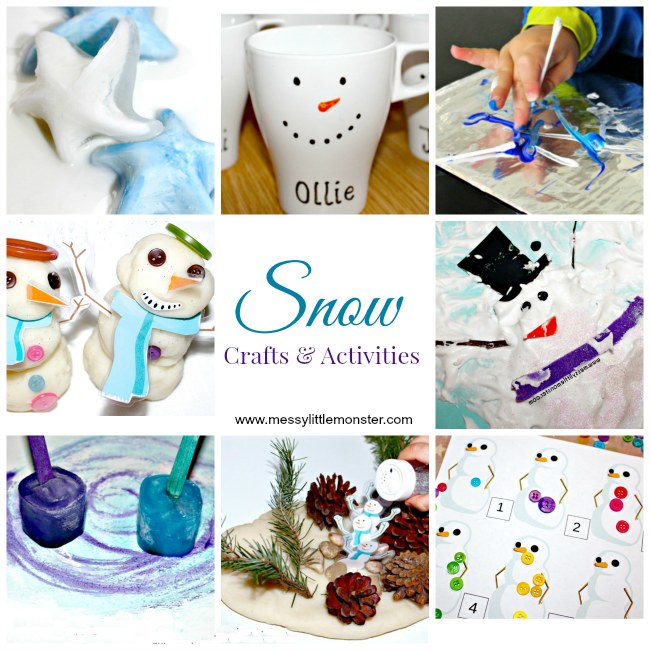 Here is a collection of our favourite ice, snow, snowman and snowflake crafts and activities for children to enjoy. There are activities suitable for all the family, from toddlers and preschoolers upwards. We have included art and craft, sensory, playdough, learning and keepsake ideas. Whether you have snow already or you are hoping some might be on it's way, these ice and snow activities are all really fun to do. The best thing is that you can stay out of the cold and do a lot of them within the warmth of your home! Take a look at our Winter book list to find some Winter books to read alongside these snow crafts and activities. Take a look at the ideas below and click on the titles to read the full details/ instructions about each activity. You might also like our winter activity calendar. Mix up some puffy paint and let your child get messy as they create their own melted snowman. Puffy paint is the best as it stays puffy once it has dried. We also now have a free printable melted snowman poem to go alongside this activity. The youngest of children can experience the feeling of ice on their fingers using taste safe ice painting sticks. The watery patterns created using these paints can be really beautiful. Making paper snowflakes is one of those classic activities that everyone remembers from their childhood. This no mess version is perfect for really young children or children that don't like getting painty. A simple activity that is perfect for toddlers. Make painty prints onto Winter themed shapes. Each piece of artwork will be unique. Create a snowy world for penguin toys to play in using Oobleck. This is a really messy activity, but soooo much fun! Explore how things melt whilst playing with an icy small world. We added lots of penguins to our small world and had to work out how to free a whale trapped in ice. Using play soap and small world animals young children will love this snowy sensory play. If you are lucky enough to have real snow but it is too cold outside for little children to be outside long, bring the snow inside. Add it to a sensory bin with a few small world toys. You can also use real snow to make snow paint. Or even mix up some paints to have a go at painting on snow! If you aren't lucky enough to have real snow, but you want to play in some why not mix up some fake snow using our easy fake snow recipe. Put it in the fridge before you play with it and it will be cold to the touch too! Print out our set of cute snowmen and add them to some white playdough. Add some pieces of nature and lots of glitter to create a perfect winter wonderland. This is such fun! Print out the snowman accessories and use them to style your own playdough snowman. This fun printable is perfect for younger children working on counting and number recognition skills. Another fun counting idea is to add the correct number of buttons to playdough snowmen. Using a felt snowflake, pom poms and tweezers young children can work on fine motor skills as they design their own snowflake. Download these cute penguins, seals and polar bears to colour in. Maybe make a snowy artic scene for them to live in. This adorable keepsake is perfect for a winter theme. Made from salt dough it can be kept forever as a memory of how small your child's feet once were. Here is another version of a salt dough pemguin keepsake, this time made from a babies handprint. We also love these snowman ornaments made from salt dough that would look fantastic hung on the Christmas tree. Another fun Christmas tree ornament to make is a handprint Snowman Ornament. This doubles up as a cute keepsake too. Older children or adults can get creative and make their own snowman mug. These make great gifts and can easily be personalised. Easy enough for toddlers and preschoolers to make these snowmen would look great hanging on a Christmas tree, be perfect gifts or be good to make to sell as a fund raiser at a school Christmas fair. These rustic ornaments look great and they are so quick and easy to make. We also have a penguin version. In the freezing cold weather we mustn't forget about the bird. Make these simple bird feeders using bird seed and hang them out in your garden. Or why not try making an easy Cheerio bird feeder. Little children can work on fine motor skills whilst making a tasty treat for the birds. So there we have it! some of our favourite snow, snowflake and snowman themed activities to try this Winter. Which one do you think you will try first? If these snow and snowman activities have left you feeling chilly why not make up a hot chocolate to warm up using one of these cosy hot chocolate recipes.